After completing 88 days of farm work to secure a second-year visa, we had to put it to good use. We stayed on Australia’s east coast for the duration of our first-year visa and decided to explore the west coast with the second-year visa. We lived and worked in Perth for 9 months to fund a road trip from Perth to Cairns and a trip across South East Asia. We lived in the car during our east coast road trip and planned to do the same on the west coast. There are plenty of Wikicamps along the west coast. We decided to upgrade our accommodation on wheels to a proper bed, rather than just throwing a mattress in the back as we did previously. A couple of hours graft and $70 at Bunnings Warehouse and our Nissan Pathfinder had an official bedroom. A little bit of form filling and planning can make your trip to Australia a little easier and stress free. It’s boring and time consuming but it’s better in the long run. Back in 2015 I convinced 2 friends, Mike and Andy, to attempt a 550-mile bike ride across 4 countries in just 8 days. 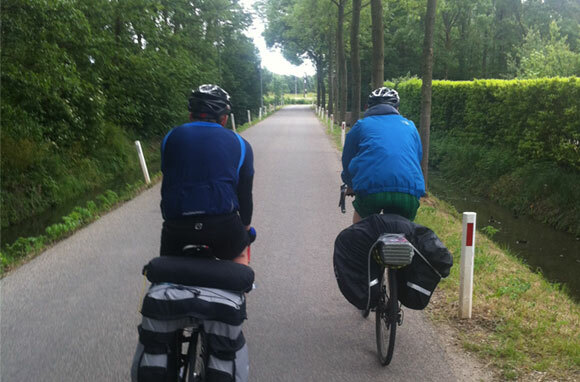 We carried our camping equipment on the back of our bikes and didn’t book a single night’s accommodation. We weren’t cyclist enthusiasts or even recreational cyclists. We commuted to work on a bicycle and that was as far as our connection with cycling went. Work is constantly available picking cherry tomatoes. The reception staff are helpful. I arrived at North Bundy Backpackers with the promise of starting work the following day. I was hoping to save a lot of money whilst ticking off the required 88 days for my second year visa. At North Bundy Backpackers everybody starts work on the cherry tomato farm until a “real” job becomes available. It took me 4 days to receive a better-paid job, some people waited over 2 weeks and others started a good-paying job on their first day. It all depends on the supply of workers and the demand of the farmers. It’s inevitable that you will spend some days picking cherry tomatoes. I completed 22 days on the cherry tomato farm and 66 days on my allocated farm. “MicroAdventure” is a term coined by Alastair Humphreys. Alastair campaigns for everyone to embrace the outdoors and have an adventure regardless of their location, free time or financial situation. A Microadventure is just that; a small adventure that requires little planning or equipment. Alastair is running the MicroAdventure Challenge throughout June, 2016. The challenge encourages his audience to have a microadventure and submit a blog post, social media photograph or video. Alastair’s goal is for a microadventure to take place in every county of the UK. My microadventure plan was simple: I wanted to catch a lobster, I wanted to go sea fishing and I wanted to wild camp. I wanted an adventure with a seafood feast as the finale. This isn’t an adventure to a fisherman. It’s a day job with a night of sleeping rough. To me, this is new and an adventure nonetheless.